My entire life, I have always been intrigued by all that is seen and unseen - the endless possibilities and the mystery of life. I have searched to find the spiritual truth that joins all people. This search, and my awareness and love of life have brought me here, where I have the extraordinary honor to teach Drunvalo's new workshop, Awakening The Illuminated Heart®. There is no greater gift that I have to offer than to share this powerful workshop with you and to help you remember that we are all Divine Beings and in a relationship of Unity with each other and with Spirit. Every moment is one of creation. I am grateful to be alive at this moment in time. It is time to recognize that we are all co-creators of our world and to live from our hearts. I was first introduced to the work of Drunvalo Melchizedek in 2008 through his Flower of Life workshop and had the privilege of taking both the Earth/Sky/Heart and Advanced training with Drunvalo in 2010. My entire being and awareness changed profoundly as a result of those 2 weeks. After experiencing the newest workshop, Awakening The Illuminated Heart®, and participating in the teacher training, I was accepted as a teacher for The School of Remembering®. There is nowhere else I would rather be ....... my Heart has led me here. Workshops will be held in Fairbanks, and I am willing to travel to other locations. If you would like to combine a workshop with travel to more remote areas, that is also a possibility. I can�? ?t think of a greater gift than to have the chance to share this experience with you. 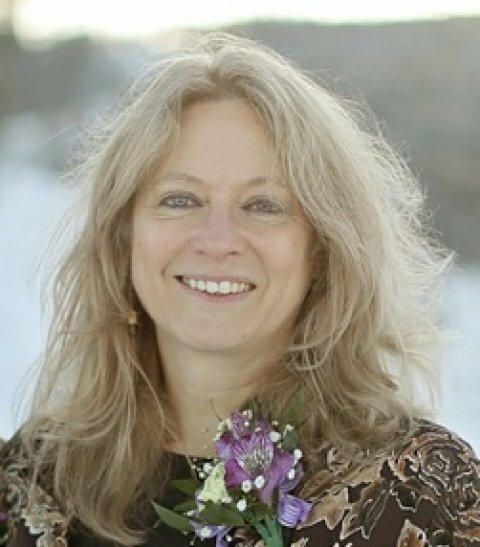 Pam is a Craniosacral Therapist and has studied energy healing with Alberto Villoldo and Jose Luis Herrera. She practices in Fairbanks, Alaska. She also works with children, helping them to expand their perceptual awareness and remember how to see while wearing a blindfold. Pam holds a Jr/Sr High Teaching Degree in Biology, and for 20 years worked as a traveling correspondence teacher, in the classroom and as a homeschooling Mom. She spent 22 years in rural Alaskan villages, and currently lives in Fairbanks, Alaska with her husband, two children, and all their animals. During her years in rural Alaska, she owned her own dog sled team and traveled throughout NW and Interior Alaska whenever possible. Those years deepened her love for Alaska and its people. Pam provided an excellent experience with joy and dedication. It was a workshop that was above my expectations, and the results for me have been amazing. I would recommend her as well as this workshop to all who seek greater enlightenment. I loved the entire workshop. I was able to release a lot in the healing and am excited about all the tools we were given. I highly recommend Pam Nelson as an instructor. She clearly lives these principles and tuned into the group in a very beautiful way. I felt supported throughout the experience. Thank you for bringing this information. Truly grateful. I really enjoyed this workshop, instructor/hostess, and venue. I challenged myself, was surprised and experienced healing, and it did give me something more to work on as I develop feelings of love and connection within myself. I'm understanding better the communication between my head and my heart. Opening up to the joy and mystery of life is something else this workshop encouraged me to do and I experienced more of that joy of just being and experiencing. I highly recommend that anyone who has background using any facets of the human energy systems learn the application presented in this class. I thoroughly enjoyed the workshop. I believe that I learned what I needed to in order to access the tiny space. Pam did a great job, and I just have a few lingering questions after the workshop to confirm that I am doing everything right. it was a wonderful workshop - Pam is the best! Amazing, life altering event with so many beautiful radiant souls in attendance. Absolutely loved it! I experienced things I never thought possible,I only wish I would have taken better notes! I wish there was an online refresher course due to the amount of material and subjects covered.